Shares of the Energy Select Sector SPDR (ETF) (NYSEARCA:XLE) have certainly been a recent bright spot in an otherwise drab market. The XLE ETF has rallied almost 5% this month versus just a 1% gain for the S&P 500. The rally in big oil stocks was long overdue, especially given the prior dramatic underperformance of oil stocks to the overall market. Now that oil stocks have caught up, I expect the rally in XLE to cool over the coming weeks. XLE is made up of the biggest names in the oil sector, with industry giants Exxon Mobil Corporation (NYSE:XOM) and Chevron Corporation (NYSE:CVX) comprising 40% of the overall ETF. There is a very high correlation between oil stocks and the price of crude oil, which makes sense. Crude oil has been up five days in a row and is now trading at the highest levels since December 2014. 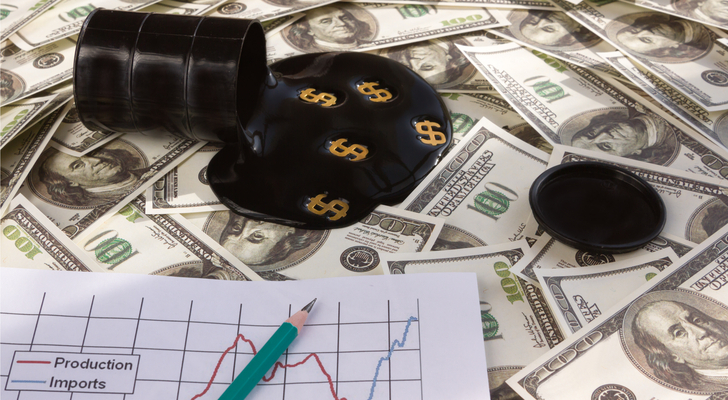 Look for the rally in oil prices, and oil stocks, to begin to weaken in the coming month. After being at its most oversold MACD reading in early February, XLE has now rallied strongly and is now at the highest MACD levels in the past two years. Previous times that MACD approached similar levels marked significant short-term tops in the XLE ETF. There is also major overhead resistance looming at the $72 area. I was decidedly bullish in my previous article on oil stocks from March 21 and suggested a call diagonal spread to profit from a pop in big oil stocks. Now that the XLE ETF has rallied over 5%, my bullish opinion has tempered to a more neutral stance-because price does matter. Implied volatility (IV) in XLE options is at the 54th percentile, meaning option prices are just slightly expensive. This favors spread strategies when constructing trades. So to position for a stall out in the oil stock rally, a call credit spread makes intuitive sense. Buy the XLE May $77 calls and sell XLE May $75 calls for a 25 cents net credit. Maximum gain on the trade is $425 per spread with maximum risk of $175 per spread. Return on risk is 14.28%. The short $75 strike is structured well above the $72 resistance level and provides a 6.18% upside cushion to the $70.63 Thursday closing price the the XLE ETF. Article printed from InvestorPlace Media, https://investorplace.com/2018/04/the-recent-gusher-in-big-oil-is-starting-to-run-dry/.